Alienware was pretty busy leading up to E3 2013, showing off three powerful new gaming laptops, size-appropriately named the Alienware 14, 17 and 18. While the angular laptops sport Intel's latest Haswell chips, it looks as though the company still has much more up its sleeve. When TechRadar caught up with the hardware maker at the annual gaming show in L.A., we asked about the tenets driving its current designs as well as what the future holds. The answer? According to Alienware's Global Product Marketing Manager Eddy Goyanes, "This is just the beginning." "We're working on a lot of exciting things," Goyanes said. "We really, really are. And that goes beyond desktops and notebooks." Beyond desktops and notebooks points to mobile, but is Alienware really developing tablets and/or smartphones in a real, actually-coming-to-market kind of way? "Nothing I could comment about really, or give a commitment for," Goyanes said, suggesting nonetheless that fans have been asking for more form factors from the company. "We hear that feedback, and we hear that feedback at the highest levels of our organization," he explained. Indeed, Alienware General Manager Frank Azor recently gave a similar tease to Slashgear, revealing that the company has thought extensively about what an Alienware tablet or smartphone will look like, but that the time is not yet right. But what about older form factors in the Alienware laptop space? When we asked Goyanes about the 11-inch size that many fans miss from the days of the Alienware M11x, he offered nothing concrete, but promised again that the company is listening. "Just keep your eyes open," he urged us. 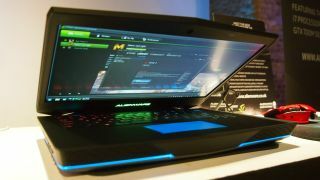 Goyanes showed TechRadar around the Alienware booth at E3, letting us get an up-close look at the Alienware 14, 17 and 18 laptops. The new laptops are big and bulky, though certainly not without their charm. Alienware designs them like that because it knows where its fans' priorities lie, Goyanes told us. "We don't sell them as thin and light," he said. "We're not competing with ultrabooks. We're trying to give gamers the most immersive PC gaming experience possible." Compared to the last generation of Alienware laptops, the three new ones are "within decimal points" in terms of weight. That's because as the materials get lighter, Alienware beefs up the specs. The Alienware 18 can go up to 32GB of RAM and multiple terabytes of storage. Goyanes said Alienware is not opposed to making slimmer devices - "so long as the technology can afford us to do that without sacrificing performance." "We do this because we don't want to sacrifice what our gamers care about," he said. "We would not try to sell this 18-inch product to someone who is looking for a Macbook Air." As Azor told Slashgear, "We're not willing to compromise the integrity of the brand to deliver a form-factor just because it's in high-demand." Goyanes added that Alienware is always looking for feedback, even on just-released products. So be mindful what you say in the comments, lest someone at the company actually take it seriously. "We can't always make everybody happy," he said. "But if there are certain features that are compelling and that people want, we'll take that feedback and we'll try to incorporate it in the next generation."